In essence, it takes many decades for new tree growth to re-absorb the amount of carbon released from burning mature trees in a single day. But the UN Intergovernmental Panel on Climate change last October said that the world has just 12 years – not decades – to drastically cut emissions or face likely disastrous temperature rise and climate impacts. The activists filing suit face a difficult fight. Only EU member states and EU institutions are generally given standing to challenge legislative acts. To gain standing, they will have to prove that they are being impacted by the EU’s bioenergy policies. The activists say that ending bioenergy coal plant conversions is vital if the world is to avoid catastrophic climate change. The Drax power stations in the United Kingdom, one of the largest users of woody biomass for energy production. 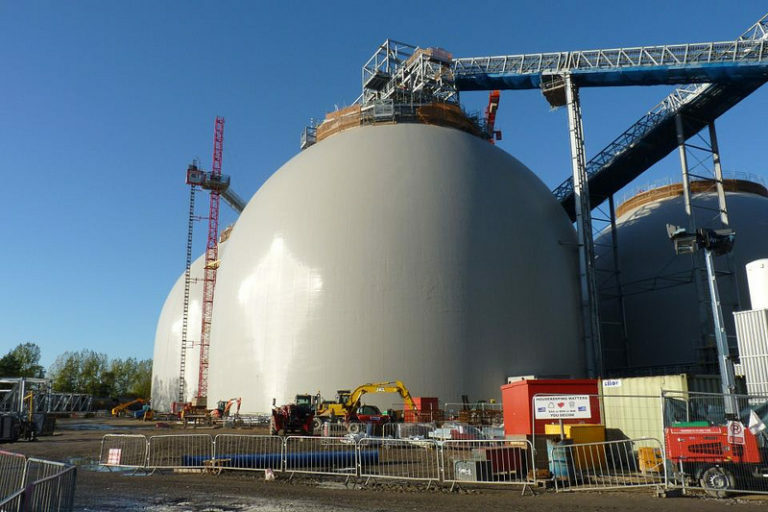 The Drax biomass dome, seen here, once burned coal but now burns wood pellets and chips. Photo credit: DECCgovuk on VisualHunt / CC BY-ND. As a result, emissions from burning wood are not counted against a country’s total carbon emissions. The Kyoto Protocol originally defined the carbon neutrality of so-called bioenergy more than 20 years ago, but many scientific studies since have shown this finding to be wrong. This new conclusion identified as the “bioenergy carbon accounting loophole” is at the heart of the lawsuit. “The EU’s policy relies on the false and reckless assumption that burning forest wood is carbon neutral. However, scientists from around the world, including the EU’s own science advisers, [have] warned that burning forest wood actually increases emissions relative to fossil fuels,” said Mary S. Booth, director of the U.S.-based Partnership for Policy Integrity, whose biomass research prompted the genesis of the suit. Ole W. Pedersen, an environmental lawyer at Newcastle Law School in the United Kingdom, told Mongabay that whatever the merits of the suit, the plaintiffs will be fighting an uphill battle to establish standing before the European General Court. Typically, individuals and NGOs do not have the right to challenge legislative acts unless they can demonstrate that they are directly affected, which the lawsuit seeks to do. Usually, only EU member states and EU institutions are given standing to challenge legislative acts. While the odds of their achieving standing may be long, Booth told Mongabay that the plaintiffs saw the suit as their next best course of action because of a continued failure to convince EU political leaders to address the bioenergy carbon accounting loophole issue. 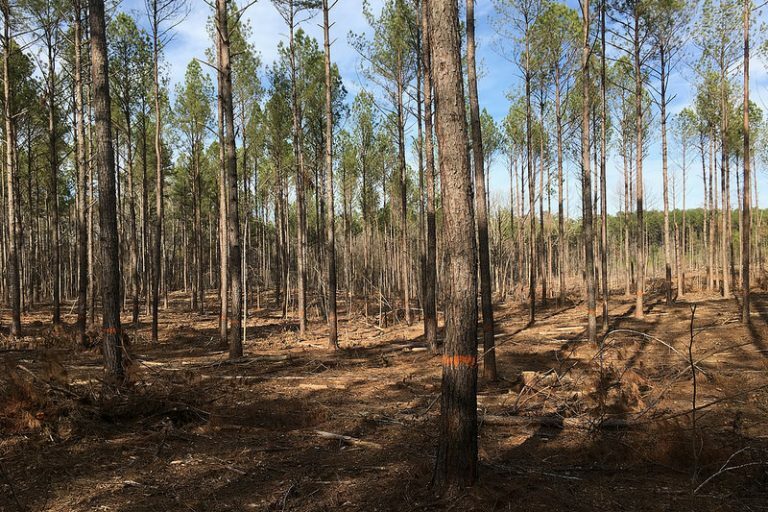 Pine forests cut to provide wood pellets for power plants are replanted, so bioenergy could technically be called carbon neutral, but only over the long term. It can take many decades for new trees to become mature and for the carbon equation to balance. But according to the most recent IPCC report, humanity only has about 12 years to reduce emissions drastically or face disastrous climate change impacts. Photo credit: ChattOconeeNF on Visualhunt.com / CC BY. The lawsuit charges that coal-fired energy plants throughout the EU are being converted rapidly to burn wood pellets harvested from forests mainly in the Southeastern United States and Eastern Europe. In 2016, nearly half the “renewable energy” produced in the EU came from woody biomass fuels, the suit states, with demand expected to increase markedly in future. Researchers supporting the lawsuit argue that because more wood pellets are needed to generate the same amount of energy as coal, wood actually produces more carbon emissions than coal. Yet because of the outdated UN Kyoto carbon neutrality policy, those emissions are not counted. Carbon neutrality in the case of biomass is based on a now discredited assumption that because new trees are planted where mature trees have been harvested, the new growth provides an offsetting sink to the carbon released from the burned wood. But findings by the Woods Hole Research Center in Massachusetts, U.S., among other studies, has shown that even if an equal number of new trees are planted – which is often not the case – it would take those new trees many decades to absorb the atmospheric carbon emissions produced by the tons of wood pellets burned in a single day. As a result, while there is technically a carbon offset eventually, the many-decades time delay is far too long, considering the extreme urgency of keeping temperatures below a critical 1.5 degrees Celsius (2.7 degrees Fahrenheit) increase over pre-industrial levels. The world has only 12 years in which to make sufficient carbon cuts to avoid catastrophic climate change, according to last October’s groundbreaking UN Intergovernmental Panel on Climate Change report. Ultimately, what’s at stake if biomass remains classified as carbon neutral, argued environmentalists at the UN climate summit in Poland last December, is the undermining of the goal at the heart of the historic Paris Climate Agreement. That accord aims to hold global temperature increases at 1.5 degrees Celsius by both reducing emissions from burning fossil fuels and preserving forests as powerful carbon sinks and protectors of biodiversity. The bioenergy UN loophole would make both goals unachievable, resulting in carbon release overshoot and unacceptable temperature increases into the danger zone, say scientists. 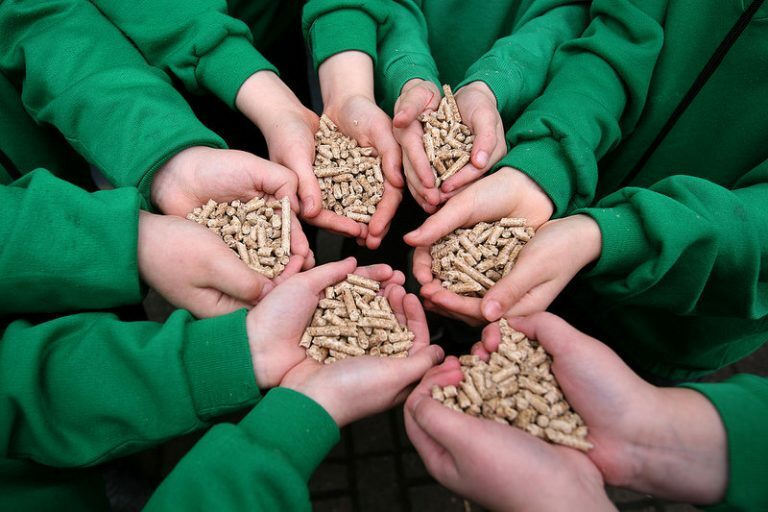 Images like this one, young hands holding wood pellets, are vigorously promoted by a wood products industry that wants the public to perceive it as green. But new studies have shown clearly that bioenergy carbon neutrality claims are false. Scientists and activists have become increasingly alarmed by governments, energy producers, and forest products companies that continue to tout outdated Kyoto Protocol carbon neutral claims. Meanwhile the UN has done nothing to alter its position, leaving activists with litigation as one of their only tenable actions. Photo credit: #ODF on Visual hunt / CC BY. If all carbon emissions are not counted fully and accurately, especially from burning wood as more forests are degraded or clear cut, environmentalists contend, greenhouse gas emissions will rise along with global temperatures — even as countries produce reports that claim they are meeting their emission-reduction targets. Closing the bioenergy loophole is urgent, say scientists. The last five years were the hottest years globally on record, resulting in intensified climate impacts ranging from sea-level rise to disappearing ice caps; to ferocious storms, droughts, wildfires and coral reef die offs worldwide; producing ecosystem damage, rising numbers of climate refugees and economic calamity. Plaintiffs in the suit from Estonia, France, Ireland, Romania, Slovakia and the U.S. argue that they have already suffered harm from logging and biomass burning, and they expect environmental harms to escalate with increasing demand for wood pellets. Each plaintiff comes from a part of the world where established forests, even old-growth forests, are being logged to produce wood pellets for bioenergy. Kent Roberson is a plaintiff from Williamston in eastern North Carolina. He argues that the 30 acres his family has farmed, hunted and lived on since 1898 has been damaged ecologically by the surrounding intensive logging for wood pellets. Birds and other animals have disappeared and forests that provided a buffer from flooding and powerful storms like last year’s Hurricane Florence have vanished as well. When the biomass industry hypes wood pellets, people often imagine the product as being consumed in small household wood burning pellet stoves. 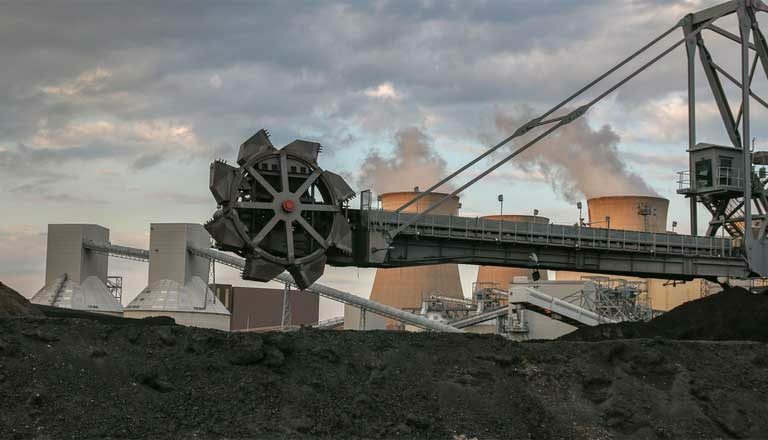 The reality is quite different and large scale, with industrial burning of chips and pellets to make electricity, as seen here at the Drax biomass plant in Britain. Photo credit: nican45 on Foter.com / CC BY-NC-SA. For its part, the World Bioenergy Organization in Stockholm, Sweden, supports the burning of biomass, including wood, as an alternative to burning coal. 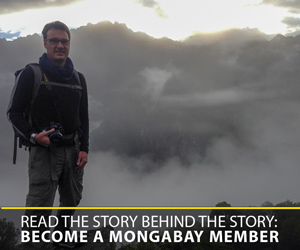 It stood by the EU policy in questions posed by Mongabay. Logging industry leaders have also argued that they do not log established forests, but rather use farmed trees, dead trees, woody residue from forest floors and wood waste from lumber mills to turn into wood pellets for burning. Kate Dooley, a researcher with the Australian-German Climate and Energy College at the University of Melbourne, countered those claims in a Mongabay interview. Depending on the legal finding regarding standing, it may now be the courts who decide the heated controversy over the EU’s burning of biomass and the UN forest accounting loophole. Banner Image: Drax bioenergy power plant in Britain. Photo credit: nican45 on Visualhunt.com / CC BY-NC-SA.